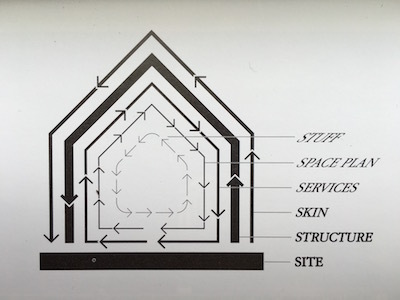 A building properly conceived is several layers of longevity. Site—the physical location of a building only changes on a geological timescale. Structure—the building itself can last for centuries. Skin—the exterior surface gets a facelift or a new lick of paint every few decades. Services—the plumbing and wiring need to be updated every ten years or so. Space plan—the layout of walls and doors might change occasionally. Stuff—the arrangement of furniture in a room can change on a daily basis. In a later book, The Clock Of The Long Now , Stewart Brand applied the idea of shearing layers—or pace layers—to civilisation itself. The slowest moving layer is nature, then there’s culture, followed by governance, then infrastructure, and finally commerce and fashion are the fastest layers. In a loosely‐coupled way, each layer depends on the layer below. In turn, the accumulation of each successive layer enables an “adjacent possible” filled with more opportunities. Each of the web’s shearing layers can be peeled back to reveal a layer below. Running that process in reverse—applying each layer in turn—is a key principle of resilient web design. Web design must mature and accept the developments of the past several years, abandon the exclusionary attitudes formed in the rough and tumble dotcom era, realize the coming future of a wide variety of devices and platforms, and separate semantic markup from presentation logic and behavior. This layered approach to the web allows the same content to be served up to a wide variety of people. But this doesn’t mean that everyone gets the same experience. Champeon realised that a strong separation of concerns would allow enhancements to be applied according to the capabilities of the end user’s device. Some web designers were concerned that progressive enhancement would be a creative straitjacket. Designing for the lowest common denominator did not sound like a recipe for progress. But this was a misunderstanding. Progressive enhancement asks that designers start from the lowest common denominator (a well marked‐up document), but there is no limit to where they can go from there. In fact, it’s the very presence of a solid baseline of HTML that allows web designers to experiment with the latest and greatest CSS. Thanks to Postel’s Law and the loose error‐handling model of CSS, designers are free to apply styles that only work in the newest browsers. This means that not everyone will experience the same visual design. This is not a bug. This is a feature of the web. New browsers and old browsers; monochrome displays and multi‐coloured displays; fast connections and slow connections; big screens, small screens, and no screens; everyone can access your content. That content should look different in such varied situations. If a website looks the same on a ten‐year old browser as it does in the newest devices, then it probably isn’t taking advantage of the great flexibility that the web offers. At the risk of spoiling the surprise for you, the answer is a resounding “No!” If you visit that website, you will see that answer proudly displayed. But depending on the capabilities of your browser, you may or may not see some of the stylistic flourishes applied to that single‐word answer. Even if you don’t get any of the styles, you’ll still get the content marked up with semantic HTML. Back when web designers were trying to exert print‐like control over web browsers, a successful design was measured in pixel perfection: did the website look exactly the same in every browser? Unless every browser supported a particular feature—like, say, rounded corners in CSS—then that feature was off the table. Instead, designers would fake it with extra markup and images. The resulting websites lacked structural honesty. Not only was this a waste of talent and energy on the part of the designers, it was a waste of the capabilities of modern web browsers. The rise of mobiles, tablets, and responsive design helped to loosen this restrictive mindset. It is no longer realistic to expect pixel‐perfect parity across devices and browsers. But you’ll still find web designers bemoaning the fact that they have to support an older outdated browser because a portion of their audience are still using it. If a website is built using progressive enhancement then it’s okay if a particular feature isn’t supported or fails to load: Ajax, geolocation, whatever. As long as the core functionality is still available, web designers don’t need to bend over backwards trying to crowbar support for newer features into older browsers. Lots of cool features on the Boston Globe don’t work when JS breaks; “reading the news” is not one of them. The trick is identifying what is considered core functionality and what is considered an enhancement. Resilient Web Design was written and produced by Jeremy Keith, and typeset in ET Book. Licensed under a Creative Commons Attribution‐ShareAlike 4.0 International License.